A dual-feed canopy is mounted to a wall or ceiling adjacent to the Kable Lite run. It can be used anywhere in the run. It brings power to the Kable Lite run from a remote dual-feed transformer (sold separately). The low-voltage leads from the remote transformer are connected to the canopy leads inside a standard 4" junction box. The four leads from the canopy are 24" long and can be cut and bent in the field. 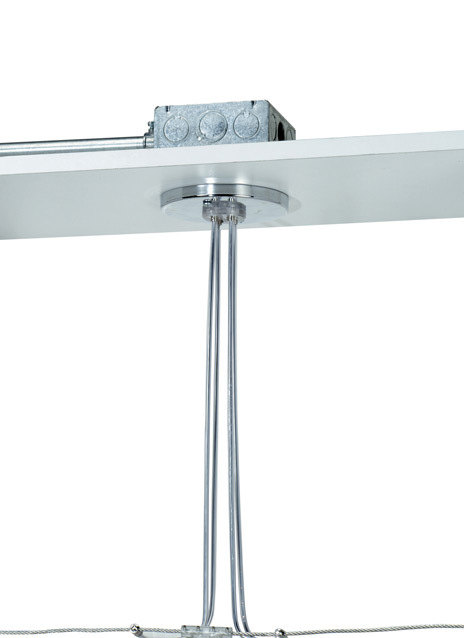 To drop the Kable Lite system farther down from the ceiling, add two pair of hardwire feeds (sold separately). Isolating connectors for bare cable are included to isolate power feeds from each other. Length -- Choose -- 24"